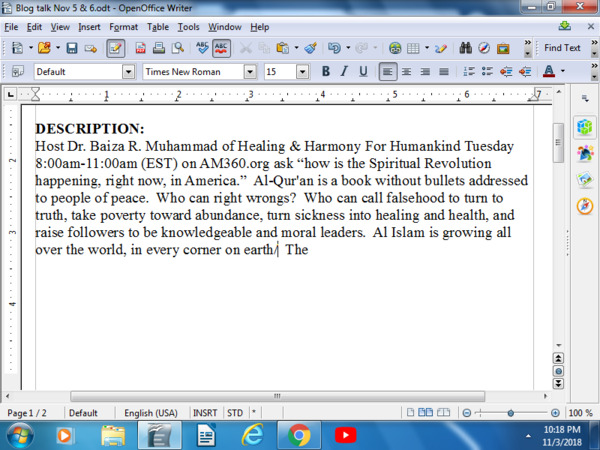 Host Dr. Baiza R. Muhammad of Healing & Harmony For Humankind Tuesday 8:00am-11:00am (EST) on AM360.org ask listeners “Why is a Spiritual Evolution happening, right now, in America.” Al-Qur'an is a book without bullets addressed to people of peace. Who can right wrongs? Who can call falsehood to turn to truth, redirect poverty toward abundance, turn sickness into healing and health, and raise followers to be knowledgeable and moral leaders. Al Islam is growing all over the world, in every corner on earth. What is drawing the people together in their respective global regions and how does Islam meet the needs of universal diversity? Don't miss the solution sounds of your voices, light illuminating broadcast. JOIN THE LIVE TALK @ 515-605-9891 or 425-292-4253. INVITE OTHERS. Listen (only) 701-719- 4197 or online AM360.org. Also, listen to previous informative archived broadcasts.